Unlike last year when we reported that Groupon had amazing deals on Omaha Steaks, we’re doing something a little different this year. Instead of calling out the “best of the best” or the “best products of the year“, we’re simply going to share with you our favorite products of the year. These products were either a lot of fun to review, or just simply blew us away with their awesome flavors. Here are our favorites by category, including some “honorable mentions” that are all worthy of being in your kitchen. Click on the names for our reviews, and by all means click on the Order links to purchase. Read through to the end to see our Favorite Product of the Year! Red’s Salsa is a flavorful, fresh tasting salsa. Simply delicious, and our favorite salsa of the year. Order. 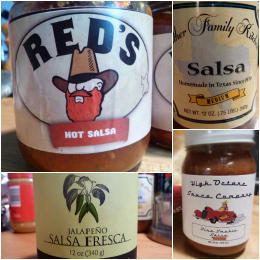 Smither Family Kitchen Salsa – This Texas company brings an onion-y flavor & mild heat. Order. High Octane Tire Smokin’ Salsa – Made with smoked tomatoes and peppers, it is the smokiest salsa we’ve ever had. Order. Gunther’s Gourmet Jalapeño Salsa Fresca – Very mild yet very delicious with great texture. This salsa goes fast, so order a few! Order. 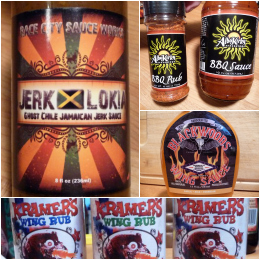 Race City Sauce Works Jerk-Lokia – Not your traditional wing sauce, but big on Jerk flavors and heat, Jerk-Lokia was featured in our Week of Wings III. Our favorite wings this year were done with this sauce. Order. Kramer’s Wing Rubs – This trio of spice rubs will help you create some fabulous dry-rubbed wings that people will rave about. A “Texas spice” rub blended in Easy Pickin’ (mild), Finger Lickin’ (medium) and What Was I Thinkin’? (hot) flavors just plain rocks. Order. Albukirky Sauce and Rub – Another great pairing of a rub and sauce, this time on wings, is from Albukirky, and we thought they yielded some of the best BBQ style wings we had all year. Order. Blackwoods Garlic Parmesan – This is a wing sauce for garlic lovers and buffalo style fans. Hand crafted in small batches, this is a delicious sauce right out of the bottle. Order. 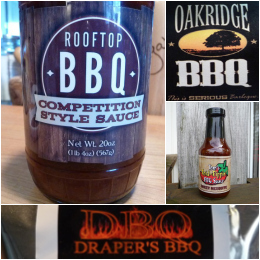 Rooftop Barbeque Competition Style Sauce – Our favorite BBQ sauce of the year included all the important elements for us – sticky, sweet, thick, and with a touch of chipotle heat – this was hands down our favorite BBQ sauce this year. Order. Draper’s BBQ Moo’d Enhancer Rub – From the award winning kitchen (labs) of Draper’s BBQ comes this deep, dark, flavor enhancing rub just meant for beef and steaks. The amazing transformation of your beef on the smoker or grill will blow your pants off (that’s a thing, right?). Hands down, the best rub we had in 2012! Order. Tom’s Roid Rippin’ Sweet Mesquite BBQ Sauce – Not so sweet, with quite a bit of heat, this dark BBQ sauce (the first from the hot sauce legends at Tom’s Roid Rippin’) was great on pulled pork sandwiches and pretty good on wings. Order. Oakridge Secret Weapon Chicken Rub – We’re including Oakridge here because of their stellar quality and packaging. While we reviewed their Secret Weapon rub on chicken, all of their rubs are top-notch. Yet another winner in the world of BBQ rubs. This rub was amazing on wings. Order. Our favorite things that defy categorization. First up has to be Punk’s Gourmet Pepper Sauce – A true “grilling sauce” that is best brushed onto grilled meats at the last minute or poured over pizza or appetizers. Yup, it’s one of those hard to categorize sauces that just rock. Get some. Now. – for the great flavor, usefulness and all around just plain likeability of it. That and creator/imagineer Marty Crews is such a nice guy. Order.. Stiff Willi Texas Chili Mix – Just a superb Texas style chili seasoning. And yet another rated product. Order. Cin Chili Serrano Hot Sauce – Featured in our Week of Mild, but by no means a whimpy sauce, this stuff is the bomb on a bowl of chili or nachos and tacos. Another rated product. Order. 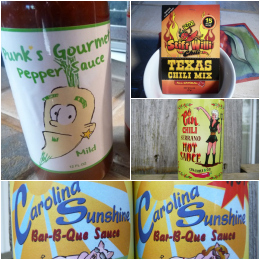 Carolina Sunshine Bar-B-Que sauce – Southerners would call this a BBQ sauce review, and it could be included in our BBQ reviews, but we’re putting it here. As Marylanders that enjoy our BBQ sauce thick and rich, this is more of a condiment to us. Delicious nevertheless, it deserves a spot in our Favorites due to how much we liked it, and its slogan: “Probably the best sauce you’ve never had.” Order. This is obviously the hardest category for us to summarize, but we try our best to bring you what we feel are truly the best of what we’ve reviewed during 2012 – our true favorites, if you will. Smoke Canyon Smoke Roasted Jalapeño Sauce – What a remarkable, simple, delicious sauce this is. Thanks to Scott Roberts’ review, we stumbled upon this sauce and it just blew us away. This should be in every single hot sauce loving, bbq cooking, chilehead fan’s kitchen at all times. for awesomeness and flavor and creativity. Order. Sweet Spicy Girl Mild Hot Sauce – Since our review, Dave Ridderbusch tweaked his label with a new design, changed the subtitle to “Mild” from “Medium” but has not touched the beautiful color, texture and flavor of Sweet Spicy Girl. She’s drop-dead gorgeous with a fantastic taste and nice heat – this is one to share with everyone in the family! Another 5 star review from us, this almost made the top slot. It’s that good! Order. Fat Cat Foods Cat in Heat hot sauce – Launched with 5 terrific sauces, Fat Cat has outdone themselves with their newest Cat in Heat sauce. Tons of heat and flavor (they call it a 10/10 heat level), this Creole based blend of 3 peppers and roasted tomatoes and smoky paprika is a complex smoky hot hot sauce. Order. Oaxacan Original hot sauce – While CaJohn’s Oaxacan sauce has been around since about 2008, our first taste test took place this year, and we loved its flavorful simplicity. Another 5 star sauce! Order. 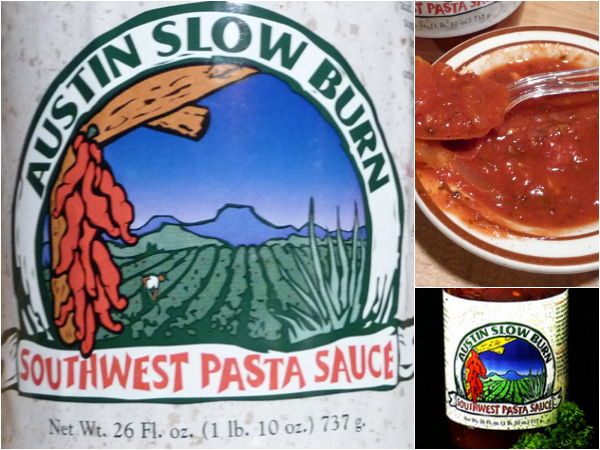 An amazing marriage of a traditional Italian pasta sauce with some spicy Southwest style seasonings, Austin Slow Burn Southwest Pasta Sauce is the bomb. Don’t be scared away, this is not a hot pasta sauce. It is very flavorful… Sweet and pungent… – for incredible taste, flavor, body and all around usefulness with pastas, pizza and baked Italian dishes. An amazing sauce that truly is our favorite product of 2012. Order. Thank you for reading HotSauceDaily in 2012. Have a Happy New Year! I enjoyed myself some Kramer’s last night, I agree with y’all. Nice. Love the bottle too. I gave one as a gift to our Secret Santa pal. 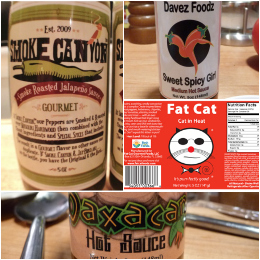 Loved this post – a great review on your favorite spicy products of 2012 – I want to try them all! Seeing my Sweet Spicy Girl sauce in the hot sauce category is such an honor for me. Thank you! Thank YOU Dave for making such a great sauce. Thanks Brian for all the kind words for Smoke Canyon. Jay-Bird loves it. You are one of the greatest. Happy New Year. I love all of these products, and I hope our readers will take the time to check out our reviews of them, if they haven’t already read them. Many thanks to the awesome manufacturers that make our hobby so much fun… and delicious! St. Louis loves Smoke Canyon! Very cool and rightly so, Gene. Thanks! Wow favorite product of the year! What an honor. Very nice article. Thanks for you endorsement. It means a lot to us. No, thank YOU Jill for making such a fantastic sauce! Now that the busy holiday season has passed, I’m on my way to ordering a case of your Austin Slow Burn Southwest Pasta Sauce !